Freelance writer Troy Chance is snapping photos of the Saranac Lake Winter Carnival ice palace when the ice-cutting machine falls silent. Encased in the ice is the shadowy outline of a body--a man she knows. One of her roommates falls under suspicion, and the media descends. Troy's assigned to write an in-depth feature on the dead man, who, it turns out, was the privileged son of a wealthy Connecticut family who had been playing at a blue collar life in this Adirondack village. And the deeper Troy digs into his life and mysterious death, the murkier things become. After the victim's sister comes to town and a string of disturbing incidents unfold, it's clear someone doesn't want the investigation to continue. Troy doesn't know who to trust, and what she ultimately finds out threatens to shatter the serenity of these mountain towns. She must decide which family secrets should be exposed, what truths should remain hidden, and how far her own loyalty can reach. A Cold and Lonely Place, the sequel to Learning to Swim, follows Troy on a powerful emotional journey as she discovers the damage left by long-hidden secrets, and catches a glimpse of what might have been. I had the pleasure of reading Learning to Swim early last year shortly after its release (a read from my personal stash). Regrettably I was unable to post a review at that time as this was during my severe migraine period (sitting at the computer, looking at the screen and simply typing was a trial). This year I was fortunate enough to be allowed the opportunity to read A Cold and Lonely Place for review purposes. Although I enjoyed reading Learning to Swim last year I decided to reread it a few days ago prior to reading A Cold and Lonely Place. I'm glad I did because it was just as good the second time around. Troy Chance is a highly independent woman. She left her home and family in Tennessee and moved to Oregon to attend college at the age of seventeen. After completing college she eventually relocates to the Adirondack region of upstate New York, the Lake Placid/Saranac area. She worked for a few years as the sports editor for the local paper before becoming a freelance journalist. She's renting a house and sublets several of the bedrooms to various athletes and townsfolk. Her constant companion is her dog, Tiger. A Cold and Lonely Place begins with Troy watching the Winter Festival ice palace preparations when suddenly a body is discovered under the ice . . . the body of one of her roommate's missing boyfriend. Troy is immediately pulled into the investigation when she is asked to take pictures of the scene for the local police. She then breaks the news of Tobin's death to her roommate, Jessamyn. What follows is a discovery of the secrets and hidden past in both Tobin and Jessamyn's lives. Once again Troy is pulled into an investigation, but this time she is functioning more as an investigative journalist as she's been asked to write a series of articles about Tobin for the local paper. As Troy seeks answers to who Tobin was and how he wound up in their small town, she learns that appearances can be deceiving and that Tobin was much nicer than she ever knew. Tobin was running from a past but not from any mistakes he made but from his family and disappointment. Her search for the truth also unveils secrets of Jessamyn's past of abuse, neglect and disappointment. The only roommate that is fully developed and explored is Jessamyn, but she winds up becoming a good friend to Troy and vice versa. Troy is also befriended by Tobin's surviving sibling, his sister Jessica known as Win. Win plays a pivotal role in helping Troy uncover the truth about Tobin's past and life after he left his family. 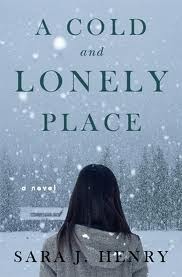 A Cold and Lonely Place seems to focus more on relationships and Ms. Henry does an admirable job in creating characters that you can relate to and be empathetic toward. The drama in this story comes more from Troy's reactions to the information she uncovers as well as how that information impacts others through her articles. Characters from Learning to Swim make reappearances, such as Canadian police detective Jameson, Paul and Philippe Dumond and their nanny/housekeeper Elise, as well as Troy's brother Simon, a police detective in Florida, and her longtime friend Baker. Jameson, Simon and Baker all function as sounding boards for Troy as well as advisers. It was fascinating to see the changes in relationships evolve as Win and Jessamyn go from being casual acquaintances to friends. At its heart A Cold and Lonely Place is a mystery but also a great read about family and relationships and their continued impact on our lives. I found A Cold and Lonely Place to be an amazing read and one that I enjoyed from beginning to end. If you enjoy mysteries and drama, then I strongly recommend you read A Cold and Lonely Place (if you haven't read Learning to Swim then add that to your TBR list as well . . . you won't be disappointed). Read a few sample pages from A Cold and Lonely Place here. Disclaimer: I received a copy of this book free for review purposes from the publisher via NetGalley. I was not paid, required or otherwise obligated to write a positive review. The opinions I have expressed are my own. I am disclosing this in accordance with the Federal Trade Commission's 16 CFR, Part 255: "Guides Concerning the Use of Endorsements and Testimonials in Advertising."